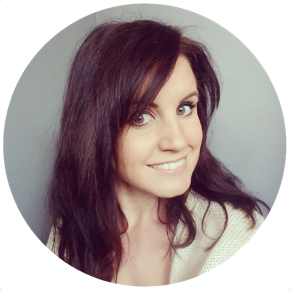 There are a number of vegan toothpastes on the market, and if you prefer to use cruelty free cosmetics, then your best bets as far as conventional toothpastes are concerned include Sarakan, Kingfisher, and most Colgate pastes (although not all). However, if you're also keen to limit the amount of plastic and aluminium packaging that you throw away, then finding toothpaste that comes in a more readily recyclable packaging, and that has a low impact on the environment, can be much harder. Enter Toothy Tabs from good old LUSH. 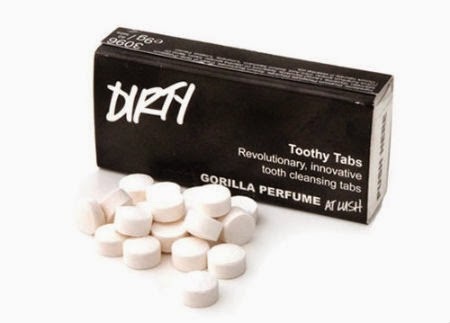 Available in a range of flavours from simple spearmint to delicate rose, and even jasmine and Earl Grey - toothy tabs are a solid alternative to pastes, meaning that they can be kept in a cardboard matchbox style container, with no need for the harmful products used to preserve and store paste teeth cleaners. When brushing your teeth with a Toothy Tab, you simply take one mint, crunch it between your front teeth and then brush with a wet toothbrush as usual. I've been using LUSH Toothy Tabs in "Dirty" (spearmint) for about three weeks, and one point of major note is that they're very foamy. You get a lot of frothy action from one tablet. I use a manual toothbrush. As far as effectiveness is concerned, they certainly freshened my breathe, and my teeth feel super clean after brushing, I wouldn't say that there is a stand out improvement in performance compared to paste, but it's certainly no worse - as usual, once I've brushed my teeth, my teeth are squeaky clean and my breathe is minty! Where Toothy Tabs score points over conventional toothpastes is obviously in the environmental factors. Many toothpastes contain animal products, so if this isn't your thing (fishes, are surprisingly the most common animals found in toothpaste) then Toothy Tabs are 100% vegan, LUSH also have one of the strictest not-tested-on-animals policies known to man! There are zero chemical nasties in Toothy Tabs, unlike most tooth cleaning products, the ingredients are natural or safe-synthetics (such as bicarbonate of soda), non-toxic, and won't do any damage to the environment once washed down the plug hole. The fragrance in toothy tabs comes from essential oils, and not artificial perfumes. It's worth noting that Toothy Tabs have also undergone dentist-lead tests to compare them against pastes and have been found to be equally, if not more, effective at maintaining or improving dental hygiene. Having swapped from pastes to LUSH's Toothy Tabs I can't see myself swapping back again any time soon, there is certainly no obvious benefit to using a paste over a solid tablet, and yet the cost to the environment is significant - I can't imagine the amount of waste we'd take out of landfill if everyone swapped from paste in tubes to tablets in boxes! If you haven't tried Lush's Toothy Tabs, I recommend grabbing a box at £2.00 a pop (unlikely to break the bank), either from your local Lush shop, or here.